My gut feeling tells me that I should announce a stable release of my “liveslak” project soon. I have implemented much more than I set out to do from the beginning, and no bugs have surfaced for a while. So it was time to stamp a final beta number on the liveslak sources and generate new Slackware Live ISO images. I want you to give them a spin and report any bugs that you find. Otherwise there may well be an 1.0.0 release after the weekend. Official liveslak version number is 0.9.0 (Beta9). The ISO images (full Slackware, Plasma5 and MATE variants as well as the lean XFCE variant) are based on Slackware-current dated “Thu May 5 05:17:19 UTC 2016” with the latest 4.4.9 kernel. Again, I added an ISO of the 32bit variant of full Slackware Live. By now the ISO images have been uploaded to “bear” and ready for your consumption. 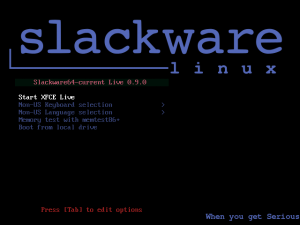 For background info on my project “Slackware Live Edition” please read the previous articles. A PXE server was added, through a script called “pxeserver”. When you boot Slackware Live from a Live media on one computer (the server), and preferably load the Live media into RAM using the “toram” boot parameter and start the “pxeserver” script, you enable every other computer in your (wired) LAN to boot Slackware Live over the network. If the “server” has Internet, then so will the PXE clients because the server will act as a traffic router. See the documentation on how to start and use the PXE server. The ISO image is still a “hybrid” ISO, meaning you can use “cp” or “dd” to transfer the ISO onto a USB stick to make that a bootable Live medium. But I changed the parameters of the “isohybrid” program to match the ones used for the official Slackware ISO images – this fixes the problem where my ISOs failed to boot in VirtualBox when the file was larger than one GB. So, every curious journalist out there who wants to give Slackware Live Edition a try will get her chance without complaining. Many other significant improvements and bug fixes during the past weeks. Check out the commit log if you are interested. As stated above, you can choose between several variants of Slackware Live Edition. There’s ISO images for the SLACKWARE, XFCE, PLASMA5 and MATE flavours using the latest Slackware-current packages available. The Plasma5 variant comes with KDE Frameworks 5.21.0, Plasma 5.6.3 and Applications 16.04.0 on top of Qt5 5.6.0. The Mate 1.14 packages have all beeen recompiled by Willy Sudiarto Raharjo to take away any possibility of issues resulting from recent library updates in Slackware. The ISO images (with MD5 checksum and GPG signature) are available on the master (bear) and should be available soon on the mirror servers. Check out the “0.9.0” subdirectory for ISOs based on the liveslak-0.9.0 scripts. A symlink called “latest” will always point to the latest set of ISO images. The Slackware Live Edition comes with two user accounts: user ‘root’ (with password ‘root’) and user ‘live’ (with password ‘live’). My advice is to login as user live and use “su” or “sudo” to get root access. Note: the “su” and “sudo” commands will ask for the ‘live’ user’s password! Consult the documentation for assistance with the various boot parameters you can use to tailor the Live OS to your needs. The syslinux boot has help screens behind the F2, F3, F4 and F5 function keys and the grub boot screen has a “help on boot parameters” menu entry. Posted: 6 May, 2016 in Me, Slackware, Software. Any idea when full Slackware 14.2 will go from to RC to final? i bet slackware 14.2 will be released 1-2 days after i decide i will do a fresh install based on current. That would not be too bad – perhaps it’s just a few packages you would have to upgrade, and then fix the mirror URL in /etc/slackpkg/mirrors. Excellent work again, AlienBob. Posting this from a pxeboot image of slackware64-live-mate! Looking forward to trying out the remainder. One question however. During the boot process, my third monitor wakes up and see’s a video sync, but once runlevel 4 is initialized, it drops off again. “xrandr” is reporting the display disconnected. fyi, it’s an nvidia geforce 9800 (old). Slackware Live does nothing to your video card or its connected displays. What you are experiencing is the kernel mode Vesa driver and X.Org treating your 3rd display differently. So if this is a bug and not a feature, it is probably something to attribute to X.Org. I’ve decided to try to do my part by testing liveslak on all the Hardware models I have here in the Lab. Started out with a Zotac ZBOX ID92. I’ve tried 0.9.0 plasma and vanilla current on the ID92. I have to add nomodeset to the kernel parameters, otherwise, the screen goes blank halfway thru the boot sequence ( I can see slight backlighting when the screen goes blank though ). I am able to startx in either live version ( plasma / vanilla ) but when I Exit KDE, the screen blanks and I cannot interface with the system via keyboard. The screen is blank, but not completely black — I can see slight backlighting. I’ve collected a few logs but this wiki page is difficult to cut-n-paste into without losing info. I’ve tried kernel parameter i915.modeset=0 as suggested on LQ and I also added the sddm to the video group ( also from LQ ). Is there another way to get you log files if you want them ? kjhambrick have you tried a real Slackware-current on that box or only the Live version? What you describe sounds like an issue with framebuffer, KMS and/or X.Org driver for your card. The ‘sddm’ user not being part of the ‘video’ group – now that is a real bug, and I see how that bug came into being. I will fix it. kjhambrick when sharing log files and other large amounts of textual data, a pastebin is always a better solution than trying to paste stuff in comments to my blog – I may delete them here if the text is too large. I’ve not tried installing Current but these boxes all run CentOS 6.x fine. I would like to replace CentOS with Slackware because I am not pleased about RH / CentOS moving to systemd so I thought this ( liveslak ) would be a good opportunity to try it. Anyhow … I have kickstart files for CentOS and these boxes are standby / spares in the lab so blowing away CentOS and installing slackware current wouldn’t hurt at all. p.s. I am not sure I said this but both Plasma and ‘Vanilla’ work beautifully after booting runlevel 3 and invoking startx. I can ssh into the liveslak machine so I may be able to ‘fix’ things or at the very least reboot from the ssh session. live plasma5 usb version works fine. No problems observed. I will have some questions about setup2hd but I am going to go “rtfm” first. I’ve installed pycrypto + configobj + pastebinit SBo.txz files on my main Laptop and I am ready to try it out. Nice app ! How did I ever live without it <G> ? I am able to ssh into the liveslack box when the screen is blank and I don’t see anything amis but the kbd and mouse are both dead. I am able to reboot remotely with the blank console. When I add these parms, liveslak ‘current’ boots normally and I can invoke `startx` for a beautiful, normal KDE 4 session. However when I log out, expecting to return to the console, it turns out that the system is hard-locked. I was ssh’d in when I invoked startx on the console. My ssh session was fine until I did the LogOff when I lost my ssh session too. I suspected KDE had ‘taken over’ the NM Session so I disabled NM and set up a static IP Addr and tried again. No luck. When I logged out of KDE, my ssh session hung and the liveslak box was ‘dead’. Did a hard-boot via the power button with the Kernel Parms nomodeset i915.modeset=0 3. I’ll try installing slackware-current-64 this afternoon and report back. And it is XOrg.log, not XOrg.conf ! Installed Current on the same ZBox I92. It boots to runlevel 3 without any Kernel Parms. The Screen is fine … in fact it’s got the same small font I see on CentOS. Going to Church will be back this afternoon. I removed the timestamps from the dmesg files. WARNING ! It is 640 chars wide to accomodate dmesg text. I inadvertantly installed the 32-bit slackware-live-current.iso instead of slackware64-live-current.iso.asc ! I re-wrote the USB Drive with slackware64-live-current.iso.asc and it is working perfectly ! When I wrote the plasma5 USB Drive I enabled luks. I am going to try again without luks … will report back. You mean, the graphical and lockup issues you were experiencing, are no longer there after you switched from a 32bit OS to a 64bit OS? That would be weird. Could that be an issue ? Did I mess that up ? I’ve tried plasma5 and 32bit … same issue for both. When I tried with another USB drive and ALL the liveslak variants work on the Zotac ZBOX ID92 perfectly ! I’ve got to chalk this up to a bad USB Drive ??? I am sorry for wasting your time, Eric. Just tried live-mate 0.9.0. First, many thanks for the liveslak images. A great way to test slackware beyond my own install. The /init script in the initrd was also a good lesson in how to use overlayfs! Hello Eric, thanks for the great work! I’m downloading mate version, and i want to ask (maybe a silly question) if these ISOs have dev packages, specifically i need the gfortran compiler. If not, how i can install it in the USB (they have persistance)? silius – I understand why you would want a warning on overwrite. But I am going to do it a bit differently and add a “-i” switch for an interactive mode that will ask that question. The default will remain: no questions, overwrite always, just like all the Linux tools. Andres, the MATE variant is a full Slackware without the KDE packages. It contains all the developer tools. If you create a persistent USB stick of it, you can use installpkg/upgradepkg/removepkg for your package management and every added/modified/removed file will be recorded in the “persistence” directory. Or you wrap the package(s) into a squaskfs module and copy the resulting .sxz module file into the directory “addons” so that Slackware Live will automatically load the module into the overlayfs when booting. The “root terminal” menu does not work because the actual command that gets executed in the .desktop file is “gksu /usr/bin/x-terminal-emulator” and even though “gksu” works perfectly, the system does not have a command “/usr/bin/x-terminal-emulator” so there will be a “no such file or directory” error which you do not see when you select the menu entry. This needs a patch in the SlackBuild. Try to upgrade to latest gksu which i have just uploaded. Note: this is only fixed in mix build only since gksu only works with GTK+2. I need to find alternative for GTK+3 build. After testing it in full GTK+3 build, it seems to be working as well, so i’m going to upload the updated gksu for GTK+3 build as well. Excelent, thanks for the response Eric. These images are definitely a great way to test alternatives, especially for desktops. I used to do full installs in a qemu VM, but it takes less time to dd an image to a usb key, and it allows to get a feeling of the real performance! John Yost, where and when did you get your copy of “iso2usb.sh”? in order to capture more information. I did not realize that the script had been upgraded. The version I was using had a file date of Mar 24 on my system. It was downloaded from your bear site. That was my only error, however the newly downloaded iso2usb.sh works fine. Excellent LiveCD Slackware Mate, thanks! What about installation on the hdd? It is possible to wait for the next version ? Oleg, what about installation on the harddisk? Just use the “setup2hd” script as documented in previous posts and the SlackDocs Wiki. You can always wait for a next version, why ask the obvious? Or do I misinterpret your question? rootcopy directory is in the iso/usb root, I had to place it inside liveslak. Also the docs refer to both locations. Finally, thank you so much for what you do. I have applied your “load/noload”diff to the liveslak script and updated the make_slackware_live.sh as well as the README.txt with the correct location of the “rootcopy” directory which is “/liveslak/rootcopy” indeed. Still need to check this into git but that will happen asap. makemod script works great. Thanks! Would be *nice* to choose at the boot menu. I have unsquashed and chmod -x /etc/rc.d/rc.sshd and resquashed, but I wonder if there is a grub way without messing with the overlay. If not, set a strong enough password via livepw= if the pc is connected to public WIFI! Thank you, runs very smooth on both my HP laptops, from DVD and USB and setup2hd! aerth, that is a valid point. The SSH daemon should indeed not be enabled by default on Slackware Live. I will disable it by default, and then allow you to use a boot commandline tweak to enable SSH daemon if you need it. (1) At the moment it seems there is only 1 32-bit build – slackware-live-current.iso, while there are several variants for 64-bit. (2) Why is there no Cinnamon variant? Is this coming later, or is there another issue? Anyway… great work and thanks for detailing liveslak in such detail. Russell, the liveslak scripts can create more ISO variants than you will find actual ISO images on my server. I will only create a 32bit version of the full Slackware ISO. Also a Cinnamon ISO will not be made available. All this due to time and space constraints. You can download the scripts and create the ISO you want, yourself – any 32bit version, or a Cinnamon version.